The local service providers of Barisal are thrilled with the seeder fertilizer drill (SFD) marketed and sold by the agricultural retailer RFL, one of the private sector partners of CSISA-MI. Compared to a traditional power tiller, this two wheel tractor attachment can be used to seed and fertilize in lines while preparing land. With minor modification, it can also be used for conservation agriculture based crop management, which lowers production costs, conserves soil moisture and can help boost yields. Using SFD results in per hectare savings of around 30 percent in fuel, US$168 in cost and about 60 hours in labor. Strip tillage is a conservation system that results in reduced tillage, improved soil moisture and cost savings for farmers, by tilling only small strips of land into which seed and fertilizer are placed. When practiced in the long term, these methods can improve soil quality. 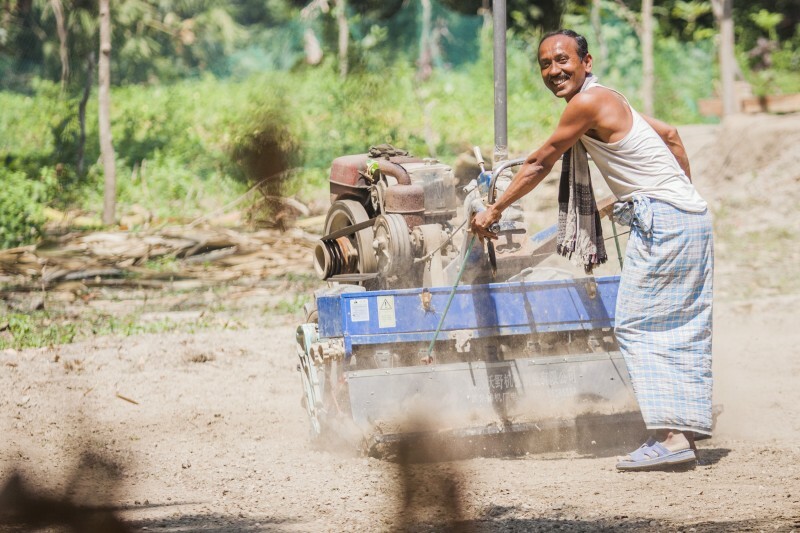 Since CSISA-MI started in July 2013, 57 local service providers have adopted the SFD, which is also known as a power tiller operated seeder (PTOS) mostly in Rajbari, Faridpur and Patuakhali districts. These LSPs have cultivated 132 hectares of land for over 205 farmers so far, mostly for wheat, pulses, sunflowers, mung beans and maize.